Can’t find the part or unit you’re looking for? Don’t get discouraged. Only the more popular units and parts are listed online, so you may not be able to find the exact unit you have in mind. We distribute many different categories of maintenance repair parts, including plumbing, drinking fountains, flushometers, closet and urinal, washroom accessories, toilet partition parts, faucet repair, tools, and much more. 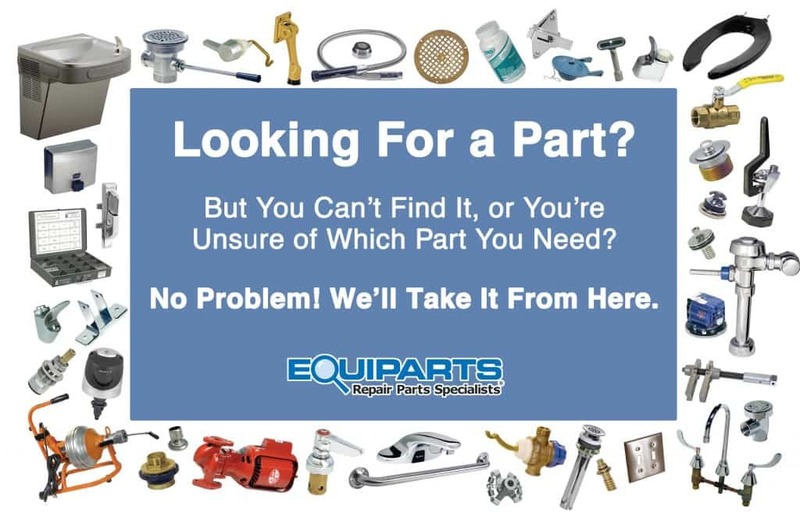 To get pricing on the unit or part you want, simply give us a call to speak directly with one of our Parts Specialists (M-F 7:30AM-5:00PM EST) 800-442-6622. You can also give us the information (make/model) you know about the unit or part when you submit an online quote request. If you’re not sure what part or unit you need, don’t worry. You can submit a photo of the part or unit you need one of two ways (if possible, please include the unit brand, model number, serial number, and any other information that will help us identify the unit). Email your photo to store@equiparts.net. Do you have more questions? Read the list of questions below to find out more about our ordering process, or go to our FAQ page to view even more questions and answers. You can place an order without requesting a quote by calling us at Monday-Friday, 7:30 AM-5:00 PM EST 800-442-6622 with the part number(s) for the item(s) you want to order. How do I place a quote online? First, find the product(s) you want on our website by using the Search Bar, or by browsing through our Product Categories. Then, to get a quote for one item of any quantity, input your quantity and click ‘Get A Quote’. To get a quote for multiple items, find the products you want, input the quantity for each product, and click ‘Add to Cart’. Once you have added all the products you want, view your cart, make sure all the information is correct, be sure to update cart, then select ‘Request a Quote’. We respond to your quotes as quickly as we can. Quotes that are submitted with part numbers are generally responded to within an hour or two (during business hours Monday-Friday, 7:30 AM-5:00 PM EST). At the latest, we will respond within 12 hours during the workweek. Orders placed over the weekend are responded to in the order they are received within the next work week. Other special research items, like quote requesting using the image uploader without part numbers, may take a couple of days to confirm. Please be patient, and we will supply you with a comprehensive quote for the products you need.